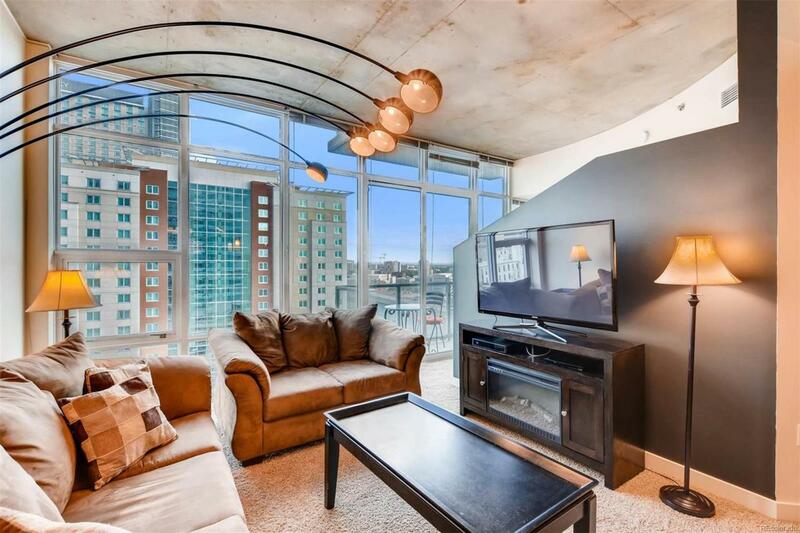 Walk in the door of this 16th story SPIRE condo and be greeted by spectacular views of downtown Denver and beyond. One of the few 1 bedrooms with floor to ceiling glass & one of the SPIRE's largest one bedroom condos. 1 Bedroom/1 bath. This home comes with 1 parking space in the attached parking garage and 1 storage unit. Fabulous wide open floor plan, stainless kitchen appliances, slab granite and unbelievable city & mountain views. Washer/Dryer included. This 42-story building is LEED-certified, with 40,000 sq ft of awesome amenities, including a rooftop pool which is heated and open year-round, two hot-tubs, extensive health club, The Zone multimedia lounge, the Box Office multimedia theater, indoor dog park, yoga garden, outdoor grilling area, 10th floor private event lounge, 24-hour courtesy desk, and modern security & access control systems. This home is available fully furnished. Furnishings are negotiable outside of transaction. Great investment opportunity with rental history! Offered by Coldwell Banker Devonshire. Association Name Primary Spire Owners Association Inc. Rental Application Contact Listing Agent.